On thinking of others’ thoughts … or not. – Sha-pow! On thinking of others’ thoughts … or not. My book came today! 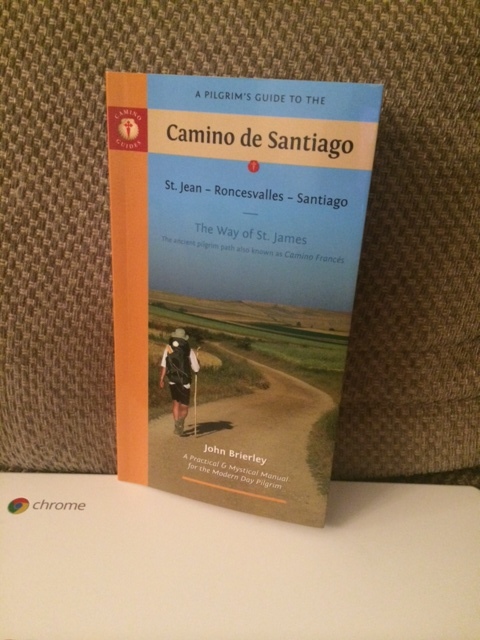 The Pilgrim’s Guide to the Camino de Santiago — from what I’ve read, it’s the holy grail of guide books, and just about every peregrino on the Camino has used it to help guide them along the way. It looks too new to me, I can’t wait til it’s all beaten up and has been loved a little. Tonight I find myself worrying about other people. In the insecure way, not the sweet way. Seeing the little tiny bit of traffic to my blog, and thinking about if other people will mock me for my passion to do this. (I know that’s not a complete sentence, but I’m not necessarily thinking in complete sentences at the moment.) I could start a new blog, but the last 8 years of my life have been documented here, in fits and spurts. I don’t want to fit and spurt anywhere else – Sha-pow and I have a history. So it will be done here, mocked or not, and I will choose not to think about what others think of my thoughts. So there.